I think the area where you produce artwork (or any kind of work for that matter) tells much about who you are as a person and creator and how you operate within the space. What a scary thought! Recently I had a very helpful studio visit from an artist friend who has a knack of moving your thinking along without ever directly referencing any of your work. In the context of the discussion, she made several observations about my space. It was a little frightening for someone (me) who likes to think she is so self aware not to notice the obvious. Boy, do I not have it all figured out. Yesterday, I documented my studio at this point in time. The last time I did this was five years ago and it is a totally different space now. There are two entrances to my studio, this is the one from the outside. The space is roughly 14 x30 and was originally two rooms in our basement. The floors are cement painted a serviceable gray, therefore I don't have to worry about making a mess. This is the clean view. Note the beige vinyl to catch my drops of wax from encaustic. To the right of the door is my paper storage cabinet and some of my books. I have extra chairs for my critique group. I've found great furniture at second hand stores and yest, I like Sunlight detergent! When it was in boxes they made great magazine or card storage. 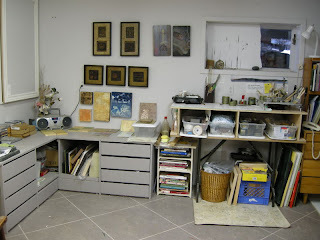 My encaustic centre is next to my paper storage. My fan is out for repairs ; I would hate to leave the impression I didn't use one. I've covered part of the window with styrofoam to help the fan draw better. I still need another window open for fresh air. The cabinet to the left provides lots of storage and a place to lay out current work. Could my work get any smaller ? If I want to create a very large encaustic I am in big trouble. I'll face that when the time comes. 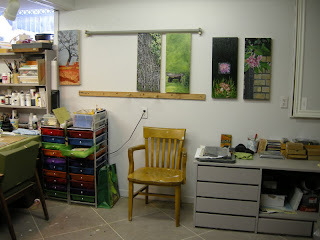 This is a newly rearranged space to allows me to work on larger pieces. The chair and the two storage bins can be moved away from the wall. My handy husband set up a system with a pipe at the top and a strip at the bottom with dowels that are movable. I hang the painting at the top over the pipe with two large c hooks that screw into the back of my panel. The dowels hold the board at a bit of an angle for better light. When I'm not working large (which is all the time), I use this space to hang ongoing work until it's completed. This is the brightest section of the room so it is an excellent space for critiquing work. This is where I usually paint. The work is either on a table easel, on the table, in my hands or lap. I store my paints and other materials in the movable carts to the right. 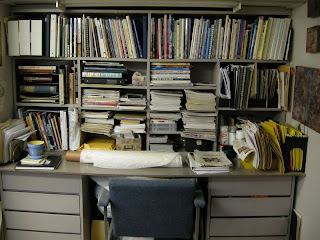 Scraps of papers for collage are in the plastic container to the left of the table. 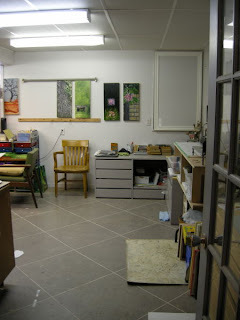 Beyond the table are a series of cabinets used for storage of work and this area is the right height to stand at to make image transfers, varnish, sort materials, and I also fuse my encaustics there. The work I have finished is hung in this area. I need more lights because this corner is very dark and certainly does nothing for viewing the completed work. I keep saying this but nobody is listening. The long view I see when I come in every day. The other chair on this side is where my three year old granddaughter paints when she comes to visit. I made a little table for her but no go. She wants to paint just like Nana. My great old chair where I read to my heart's delight. I'm presently reading "Rethinking Acrylics". 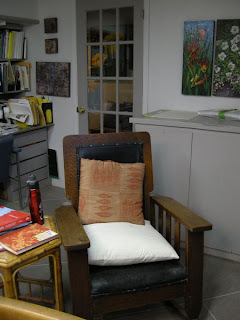 The door behind the chair is the exit to upstairs and the way I enter the studio. You can also see the corner of my desk area. My desk area, more books and lots of storage. All the drawer units came from a retrofit of dorms at the local university. My husband knows everyone and is always on the look out for a good deal. I always benefit. 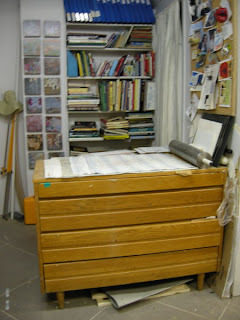 More books, more paper storage and my table I use to roll out monotypes. Did I say more books? You can see my trusty 85 pound steel roller near the wall. 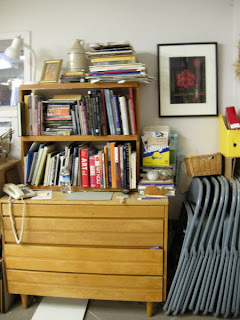 My one easel ( portable for painting on location which I never do anymore) is in the corner. My sun hat never gets used much for painting these days. Next to the bookcase is a storage space under the stairs. I keep saying that shelves would really tidy up the space. No one is listening. And here we are back to where we entered. 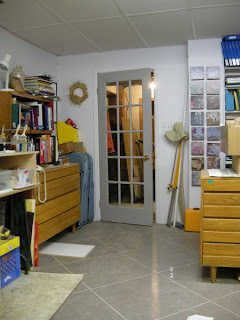 If you turn right after you leave my studio you will be in my husband's workshop. Sometimes I go downstairs to paint and I find whatever project he's completed smack in the middle of my floor. That's another story. I hope you enjoyed your visit. You now know a lot more about me, my personality and working style. Do tell. This was fun...thank you! I felt the walk around quite nicely and glad about your organized encaustic set up! Storage, and books look great but I know, never enough! What I think I heard you say is you need more lighting and a space for working larger...stepping back space? I think the 'reveal' is the commitment and love for the studio time. Thank you for sharing with us an intimate tour of your studio. It's wonderfully organized, and looks like some serious work is done there! It's also good to see so many pieces of your work displayed together. You have lots of lighting, too, I notice. 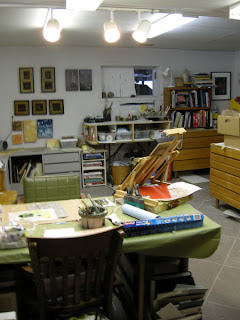 Although I'm organized, one of my studios looks like paint has been slung everywhere (it has!) and the other, newer one, is too pristine (gotta' mess it up some). Love your chair, too!! I hope you're careful with that roller! I'm envious of your wonderful studio. Thanks for opening it up. I so enjoyed this post and thanks for the visit to your studio! I enjoyed the tour--very organized. I've learned that nobody listens--until you pick up the phone and call the electrician or the carpenter. Forgot to mention that I have a couple of Morris chairs--love the wide arms. Hello Margaret, this was a great tour, almost like being there! I know nothing about encaustic, must you have a lot of ventilation? Or is that due chemicals or oil paints. your husband is a sweetie-head, just like mine. I have a good exhaust fan in the window over my encaustic palette because when the wax is heated there is an odor. I also sometimes tint my encaustic medium with oil paint. If you are careful with your temperatures (I am obsessive) the process is quite safe. Yes, we are lucky to have helpful supportive husbands. 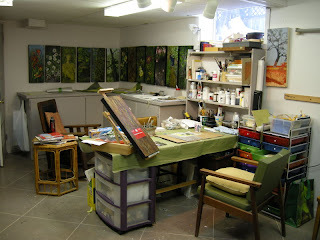 Margaret, what a wonderful, large, organized studio and I enjoyed the tour. You have everything laid out so well. I learned the same thing as Hallie. Things get done when I call the service people. Sometimes just a hint spurs the handyman to action. Your husband sounds like a love. Thanks for sharing. Also, thanks so much for your suggestion to write down what I learned from the piece of work and attach it to the back. I'm adopting that idea! Thank you for letting us into your space and seeing the surrounding where you create your beautiful art. Anyone who has dedicated space to be able and create art within the area is indeed a lucky person. Waves of envy are sweeping over me. Thank you for this conducted tour of your studio, it looks wonderful. Thanks for sharing your studio with us today. I enjoyed the tour - especially seeing your works on the wall and your works in progress. It was a pleasure showing you my what I consider cluttered but organized studio. I debated taking my work for the upcoming exhibition off the walls because it is so poorly lit and piled together in one spot. It looks dark and oppressive but I assure you it isn't. I feel like I've been a poor hostess because I didn't lay out token coffee cups and sweets for you in the virtual tour. I just gave myself permission to paint larger this past week by opening up a space on the walls for larger painting. Otherwise I paint with my glasses off- imagine how close up I like to get. Stepping back space is greatly needed. There are small paint spatters around my table. I should have shown them! I have friends who are very adept and versatile. My machinist friend made the roller for me. It functions beautifully for monotypes but any other printmaking I do means a rental at the print shop. Thanks for stopping by. My workspace and house in general is so great thanks to the woodworking skills of my Don. I dream it up, he makes it. I am lucky that the person who needs to listen is in the house. He is just putting those two projects on his back burner. I chuckled long and loud when I arranged this series of photos. My background as a primary teacher is so evident in the studio space. Each area is set up as its own self contained centre. Young children need to know where things are if they are going to be independent in their learning. I'm so transparent! I'm glad you liked my tip about writing down your reflection about your working process and results on the back of your work. Sorry someone else holds #1. It would be difficult to surpass him. Your are wickedly observant! No one will ever have any visual secrets with you around but.... I sneaked one by you. There was a second bottle of water on the top of the first chest of drawers. The fact you missed it gives me great pleasure. Yes, I am lucky to have a designated space to work in where I can just get up and leave it all as needed. There's something about going to the studio that puts you in a working mood. Oh, Margaret -- my eyes are a nasty shade of green. What a great tour -- many thanks for taking the time to share. 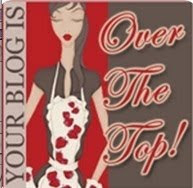 I think I will post my "dream" spaces on my blog as my actual space is pretty dismal! Glad to see that I am not the only bookaholic. Thanks for the interesting tour. What an engaging visit to your studio Margaret! Thank you! Thanks for the Post; I'm not a professional either at all. Wow, great studio Margaret. I enjoyed the tour. I loved seeing your studio. You've got a space for several mediums, lots of books and my fav- a reading chair- covet, covet ;) It has the look of a useful, working studio and fits the bill perfectly for "a room of one's own." So what does this tell me about you? It gives me the impression that you love art and making art more than simply talking about making art. Fantastic!! How I'd like to have a studio as nice as yours!!!! !